Achilles, ‘best of all the Greeks’, is everything Patroclus is not — strong, beautiful, the child of a goddess — and by all rights their paths should never cross. Yet one day, Achilles takes the shamed prince under his wing and soon their tentative companionship gives way to a steadfast friendship. As they grow into young men skilled in the arts of war and medicine, their bond blossoms into something far deeper — despite the displeasure of Achilles’s mother Thetis, a cruel and deathly pale sea goddess with a hatred of mortals. Why did I read this book: One day, I was minding my own business, reading through my Google feed reader when I came across Victoria’s review at Eve’s Alexandria. In this review, she waxes poetic all over the book and concludes that the author turned the Iliad “into the greatest gay love story never told”. I knew then and there I had to have this book. How did I get this book: Full disclosure: I received a review copy from the publisher after requesting a copy as soon as I read that review but the author also sent me a copy of the book after seeing me tweeting about the book (although I haven’t received it yet, I blame it on the Atlantic Ocean). I cannot begin to express how happy I am to have read this book before the end of the year and just in time to add it to my top 10 of 2011: a veritable Smugglivus miracle! The Song of Achilles is so good, it is one of those books that makes me want to be a better reviewer so that I can do it justice, so that more people can read it. This is my attempt to sing its praises. In Greek Mythology, Achilles is one of the greatest heroes of the Trojan War and one of the main characters of Homer’s Iliad. Son of a minor Goddess, the Nymph Thetis and of a human, King Peleus, it was foretold that Achilles would be a great hero, immortalised forever by his exploits during the Trojan War, but that he would die young if he joined that war. Choosing to follow that path to Glory and Fame, Achilles is effectively the Greek’s main weapon against the Trojan army: his aim is sure, the invulnerability of his body legendary and his beauty a thing to behold. He is also extremely arrogant, prone to unquenchable wrath and proud to the point of hubris. And it is his pride that eventually costs the lives of thousands of Greece when he withdraws from the fight due to a feud with Agamemnon, the Greek Army’s leader. He only returns to battle after his best friend Patroclus dies killed by Hector, Troy’s beloved hero. This sets the stage for the final act of the War and of Achille’s life. His revenge on Hector for Patroclus’ death is pitiless and cruel as he not only slays him, but he dishonours his body by dragging it behind his chariot and denies him a proper funeral. At least until Hector’s father, the King of Troy begs him for his son’s body. Soon after that, Achilles is killed and his ashes are buried together with those of Patroclus. Needless to say, Patroclus and Achilles’ is a seminal relationship in Greek Mythology and in The Song of Achilles, Madeline Miller posits that it is also a deeply romantic one. Told from Patroclus’ point of view, the story starts with his own childhood, growing up as a Prince, hated and bullied by his own father for his weakness and naivety until he is exiled to the court of King Peleus after killing a noble’s son in an accident. It is there that he meets prince Achilles, who soon becomes a childhood companion, a close friend and eventually, the love of his life. In this book, Patroclus becomes more than a secondary character and through his eyes, Achilles is presented in a different light. Their budding love story is absolutely beautiful. Patroclus can hardly believe that a Prince like Achilles, a semi-God with a real future could take any interest on an exiled, nameless boy and yet he does. Their baby steps toward becoming lovers are awkward, fraught with fear of discovery but also extremely tender. Achilles is absolutely devoted to Patroclus (and vice-versa) in a relationship of equals: Achilles might the greatest hero of the Trojan war but whenever he steps back in their tent, he is Patroclus’ comrade, playful mate and ardent lover. Mind you, Patroclus’ perspective goes a long way in humanising Achilles and making him more of a nuanced character but never letting us forget that Achilles is a self-centred and proud warrior and has but one goal in life. The key element of this story is how Patroclus’ narrative unveils the possible motivations behind Achilles’ actions. He is fearful of his ultimate demise but wants the glory more than anything in the world: after all, he was brought up to have it. His refusal to fight in the war, an inaction that causes so many deaths could be interpreted (but never excused) as a fierce protection of his honour, the one thing he will have after his impending death. His hubris is such that he wants to be the greatest hero that has ever lived but also hopes and expects for the happy ending that has been denied to all heroes before him. And in one of my favourite scenes in the novel, Achilles tells Patroclus that his happy ending is wholly dependent on Patroclus’ being with him. Another favourite is how the author incorporated the prophecy that Hector’s fall precedes that of Achilles. He knows that and for ten years manages to avoid facing off Hector in the battlefield by saying – to the puzzlement of his fellow warriors – that Hector has never done anything against him, why would he pursue a fight against him? Of course the savvy reader knows exactly what Hector will eventually do, and there is a sense of impending doom and tense narrative that is all the more impressive considering how well, everybody knows how the story ends. And when it does end in tears and grief so intense, the tears and the grief within the story were mirrored by my own. Major kudos to the author for being fateful to the original but writing it in a way that makes the very ending to this story, a happy one. In addition, even though I feel that the main focus is the love story between Achilles and Patroclus, their story does not happen in a vacuum. There are other interesting, well developed characters (I especially loved Achilles’ mother Thetis and her side of the story) as well as themes that are intrinsically linked to a story such as this. There is the potential discussion of fate and free will and the fact that Greek Gods are meddlesome and even cruel and yet humans hardly questioned it. There is also Achilles’ heroism itself which is fabled and expected even before he has done anything even remotely heroic. Not to mention the fact that the ideal of Greek heroism is so completely different to our own ideal of what being heroic means: it is more about deeds than behaviour. 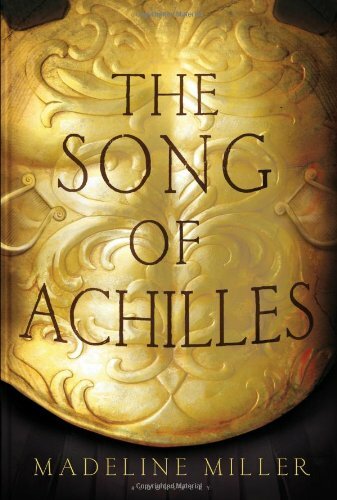 In that sense, I feel that in this book’s version, Patroclus could be constructed as the heroic one of the duo (due to his actions during the War) and to a certain extent this is a modernised, contemporary view of this story and one that I truly enjoyed. Finally, I loved how The Song of Achilles is ultimately, Patroclus’ plea for Achilles to be not only remembered as the self-centred, egotistical Trojan War hero whose selfish actions were directly responsible for the deaths of thousands of Greeks but also as a wonderful musician, playful mate, someone capable of deep feelings and a devoted companion and lover. My own plea is that you read this book immediately. This feeling was different. I found myself grinning until my cheeks hurt, my scalp prickling till I thought it might lift off my head. My tongue ran away from me, giddy with freedom. This, and this, and this, I said to him. I did not have to fear that I spoke too much. I did not have to worry that I was too slender, or too slow. This and this and this! I taught him how to skip stones, and he taught me how to carve wood. I could feel every never in my body, every brush of against my skin. He played my mother’s lyre, and I watched. When it was my turn to play, my fingers tangled in the strings and the teacher despaired of me. I did not care. ‘Play again’, I told him. And he played until I could barely see his fingers in the dark. I saw then how I had changed. I did not mind any more, that I lost when we raced and I lost when swam out to the rocks and I lost when we tossed spears or skipped stones. For who can be ashamed to lose to such beauty? It was enough to watch him win, to see the soles of his feet flashing as they kicked up sand, or the rise and fall of his shoulders as he pulled through the salt. It was enough. Rating: 9 – Damn Near Perfect. Uh, I’d say you did a super job with this review and did the book justice! It’s now on my TBR list, but I’m curious: how did Miller handle the narration after Patroclus’s death — or does it stop there? VERY GOOD question! I thought she did a BRILLIANT job at handling it and it is in fact probably one of my fave things about the narrative and why I loved the ending so much. I am happy to tell you more but I think it would spoil it for you! Let me know! Nope! In that case, don’t tell me, Ana. We will consult later! Legit, as soon as I finish typing this comment, I’m navigating over to amazon to buy this one. It sounds AMAZING. I always said I’d love the Illiad more if Homer didn’t write it (sorry, the Rosy Red Dawn with her golden fingers can take herself to the far end of the ocean and drown herself as far as I’m concerned), and I am so so excited to see this different take on Patroclus’ story, who I always wanted to know more about. Thank you so so so much for recc’ing this! I’ve had this book on my watch list for a really long time and the reviews have just up my anticipation for it! I am probably going to cry when I finally get this book in my hands. What an amazing review! Darn, I wish I could re-write my Christmas list now! Don’t re-write it too fast– it’s not out until March 6, 2012!! Thanks for the comments, everybody! If you do get to read it, I hope you will love it as much as I did. @Franki: Hi, Franki, the book is actually already out here in the UK (since September)! 😉 I bet MarieC could get a copy from Book Depository, they ship for free! …I have to pick this up now. I’m starting this right now – so excited to get into the story! This is such a beautiful review!! I recently read the book and loved it so much.. Your review definitely did justice to the story..